So many people these days have a side business, and network marketing opportunities have really been gaining in popularity. With the help of Facebook and other social media I watch so many of my friends as they work at growing their businesses. Some of them do really well, and some of them struggle. I understand the struggle. I have worked in the corporate world, and have run a business of my own for over 20 years, yet I still struggle. Part of that struggle has to do with keeping things simple enough that anyone can build a successful business while at the same time being encouraged, and challenged to become more and better along the way. Building a successful network marketing business requires duplication. Duplication requires a system. A system is nothing more than practicing some simple disciplines over and over. So much of who we are and what we do is determined by small, daily habits. It’s the same with building your business. It’s a matter of mastering some simple skills that are easy to do, but at the same time just as easy not to do. We could say that a system is like a river, and the success you’re after is downstream. To truly be successful in network marketing you need to help others be successful. So you need to help them get downstream. Throw people into the river! Better yet, you get in the river and pull people in and all go down stream together. Ever wish you had something that could give your business A Lift? On our team we utilize a duplicable system of support and training that we refer to as the A-LIFT System. Daily training calls to help you develop small habits that will propel your business towards a thriving, growing business. Each day of the week, Monday thru Friday, we spend 20-30 minutes unpacking one of the A-LIFT skills. We also hear a testimonial each day to start the call. A 5 minute story from someone on the team of how the product or business opportunity has effected their lives. Attitude – Having a positive attitude, an attitude of gratitude, a “can do” attitude, an attitude of self responsibility, a self-employed attitude. These are all attitudes that we build our business on. List – Who are we going to talk to? Who are we going to share our products or services with? Who would we love on our team? We don’t know who might be looking for an opportunity, or might be in need of the product we offer. So everyone should go on your list. Invite – What are we going to say when we invite people to take a look at our products, and our opportunity? We use tools to tell the story; videos, audio recordings, online presentations, local or home presentations, and brochures. We let the tools do the talking. We’re simply the messenger. You don’t need to be a great presenter, or know every little detail about your product, service, or opportunity. Let the tools be the message. Let the tools share the story because that is duplicatable. Follow-Up – Follow-up and collect a decision. The fortune is in the follow-up. This is where you sift and sort. You are never in the business of convincing. You are simply interested in finding out who is interested in learning more. Who would like to try the products for themselves. Who is looking for a business opportunity. Who would like to join you in business. Teach – Teach your team to do the same. Keeping it simple and duplicatable. It’s not what WE DO, but what we duplicate. 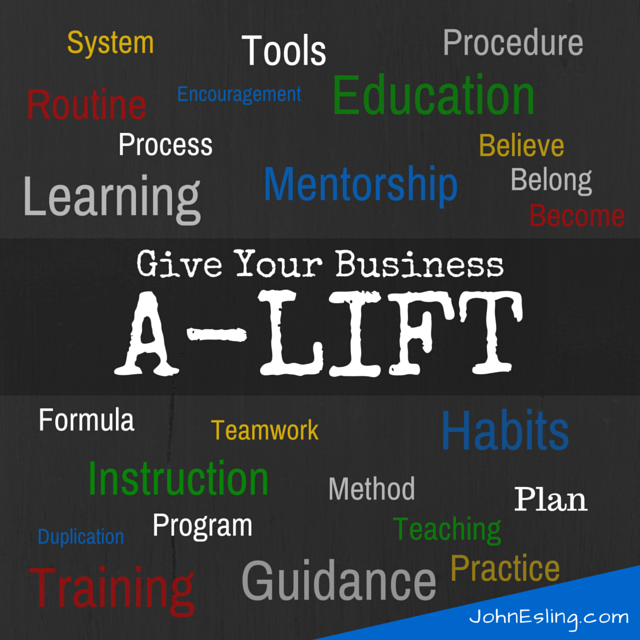 This A-Lift process has been crucial in the success of so many people. It has been a huge blessing in my life and business. I’ve heard it said that a network marketing business is a personal development program disguised as a business. That has definitely been the case for me. I invite you to reach out to me and lean more about this A-LIFT system of training and support. I’d even recommend tuning in to our daily calls for a couple weeks to see what you think.